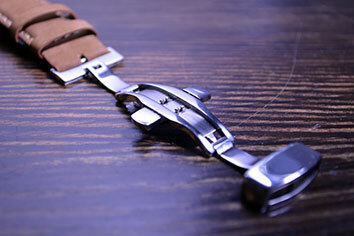 A butterfly clasp is named for its two "wings" that fold in to close your watch. When closed, it is virtually hidden beneath the band and makes opening and closing simple with no holes or other buckles. Using a butterfly clasp can also keep your leather watch band from unnecessary wear and tear, helping your time piece to last longer. The Value Of Life & Time. Buy the best personalised affordable dress watches, an engraved watches for him or her! © 2015 Cousin Corporation Limited. All Rights Reserved.